Situated on the north shore of Brisbane River just a few kilometres outside the CBD, Hamilton Harbour is an exciting mixed use development with excellent city views up the river. 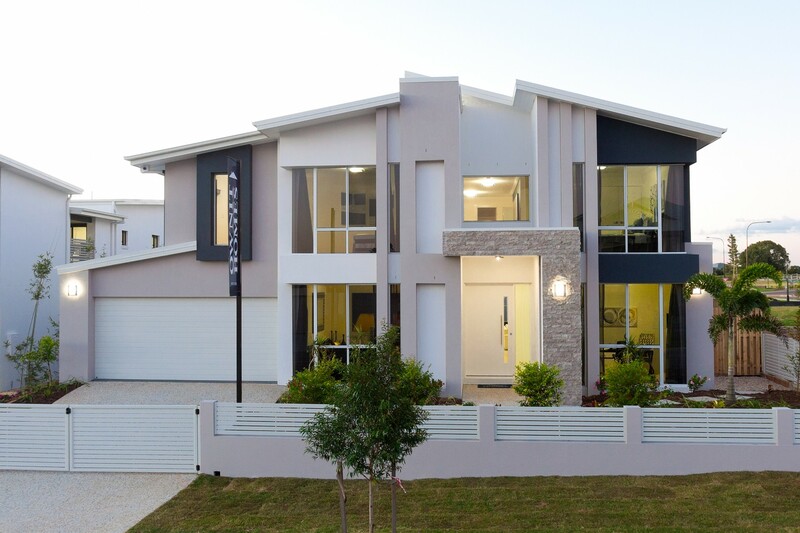 The project is designed by Cox Rayner Architects and is a joint venture between developers Devine Limited and Leighton Properties. The first stages of the project saw two residential buildings constructed, both of which have been fully completed with residents already moved in. The final stage will see an additional residential tower and up to two commercial buildings built on the site. The first two residential towers, Harbour One and Harbour Two, are 22 and 19 stories respectively. They were constructed simultaneously and completed in November 2011. The third stage commenced as these buildings neared completion, when construction of Riverside Hamilton, a twenty storey residential tower began. The first commercial office building, named “KSD” after the adjacent Kingsford Smith Drive, is 5 levels high and presently under construction. G.James has been working to supply windows, doors, shop fronts and façade glazing for all four of the present buildings. While energy efficiency is one of the most important factors in the design of a building, given the close proximity to busy Kingsford Smith Drive careful attention has been taken to achieve a high standard of acoustic performance as well. To achieve these ends, a number of high performance products have been incorporated into the design. Apartments with sliding doors incorporate the G.James 445 series sliding door system, and are glazed with IGUs for their sound deadening properties. The fixed windows use the 451 and the higher rated 651 series pocket framing systems, also both designed for accommodating IG units. 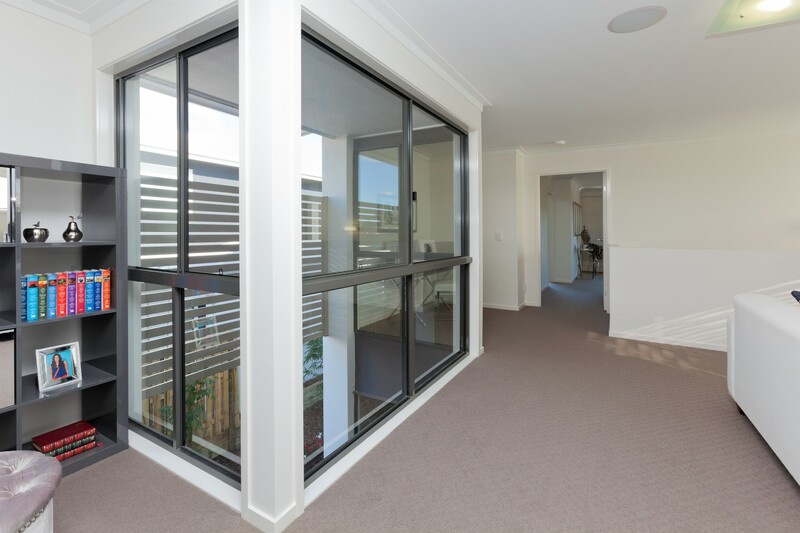 Alfresco bi-fold doors in the apartments use the 477 series bi-fold door, with a 550 series glass balustrade on the balconies for excellent views. The ground floors of the residential buildings have been glazed using the 650/850 series shop front glazing system. Acoustic performance was particularly important for apartments on the road side of Riverside Hamilton. In these apartments an acoustic door arrangement was used to achieve excellent noise isolation, comprising a 445 series external sliding door with a 245 series internal sliding door. The simultaneous construction of Harbour One & Two initially posed some challenges for the G.James Eagle Farm factory, as it was already working on two other high rises at the time. To cope with the demand, the work was spread between the Kingsford Smith Drive and Gold Coast factories to deliver results on time. At present, construction on Riverside Hamilton is wrapping up and work is well under way on the commercial KSD building. G.James has commenced work installing frames for the ground floor shop front, and will be installing the curtain wall façade in the coming months. G.James is pleased to have been working very closely with Devine on this project to achieve the desired outcomes, and look forward to further developing our working relationship. Stay tuned for the final article and more photos of the finished project. On average, glass comprises around 25% of a home’s external surface. Along with providing light, ventilation and protection from the elements, this makes choosing the right windows and doors one of the most important decisions when building a home. These five key points highlight some important aspects to consider when selecting the supplier of windows and doors in your new home. Is your window supplier an Australian Window Association (AWA) member? The AWA Product Accreditation Program ensures that accredited members manufacture their windows and doors to exacting performance criteria. AWA members are also required to produce windows and doors which meet the requirements of all relevant Australian Standards are subject to third party annual audits to ensure continuing compliance. More information on the benefits of dealing with an AWA member can be found on the AWA website. Choice of frame colour can be an effective tool in either complementing or contrasting your interior and/or exterior colour schemes. Aluminium windows can be ordered in either powder coated (painted) or anodised finishes offering you a wide selection of colours. An example of typical colours available in anodized and powder coated aluminium can be found in the G.James Colour selector. Your chosen finish must also be able to withstand exposure to the elements, so a reputable supplier will provide a guarantee against premature weathering of surface finishes. The correct glass selection can offer a number of benefits. Savings on heating and/or cooling costs. Extending the life of soft furnishings. The basic type of glass used depends on application – in areas where accidental impacts are a concern, toughened and laminated glass are much stronger and safer than regular annealed glass. Using annealed glass in areas where the extra strength is not of tangible benefit is however more economical. Climate is another major factor in the selection of glass – in warmer climates toned or coated glass will offer performance benefits, whilst in cooler climates IGUs (double glazing) will improve heat retention. The most suitable products for a home will vary on a number of factors, so you should speak to a professional to discuss your requirements. Price should not be the only consideration in seletion of windows and doors – value should also be assessed in terms of the extra features and long term benefits offered by the product. Does the window have a rigid PVC sill insert for weather performance and easy cleaning of the sill? A threshold (cover) in the door sill should also be present. Are the flyscreens easily removed both internally and externally? This is an important feature, particularly for two storey homes. Are window handles located in the centre? Handles located at the jamb (side) can be difficult to access behind curtains or operate when fully opened. Do the window rollers contain stainless steel bearings, important for long term performance? Are the window rollers of sufficient size? Smaller tyres can develop flat spots which causes the roller to skid along the track rather than roll. Are the rollers height adjustable? In the event of faults with sliding windows, doors or associated hardware, you must be able to rely upon your supplier to rectify any issues. A written warranty from a trustworthy and well established company gives you peace of mind of knowing that you won’t be left out of pocket if something does go wrong. It is necessary to read and understand your warranty agreement to know the conditions under which you are covered. It is also important to choose a supplier who offers a stable product line with standardised features and parts across their products – you don’t want to be left with non-functional windows or doors because the supplier can no longer obtain the right parts. A supplier must also keep sufficient stock/parts on hand in order to rectify faults quickly. Researching your window and door options will help you make an informed choice, but don’t hesitate to consult with an expert for help in selecting the ideal windows and doors. An experienced local glazing professional will help you tailor a solution to suit both your preferences and local conditions. The Stock Exchange Arcade in Charter’s Towers began life as the ‘Royal Arcade’ in 1888, and was a mixed use building with retail & office space. A couple of years later it became home to the stock exchange which gave the building its present name. This stock exchange was one of a number of regional exchanges in Australia, and was started to service the needs of the booming gold mining industry in the area. Eventually the mines ceased to be productive, and the stock exchange shut its doors in 1916. 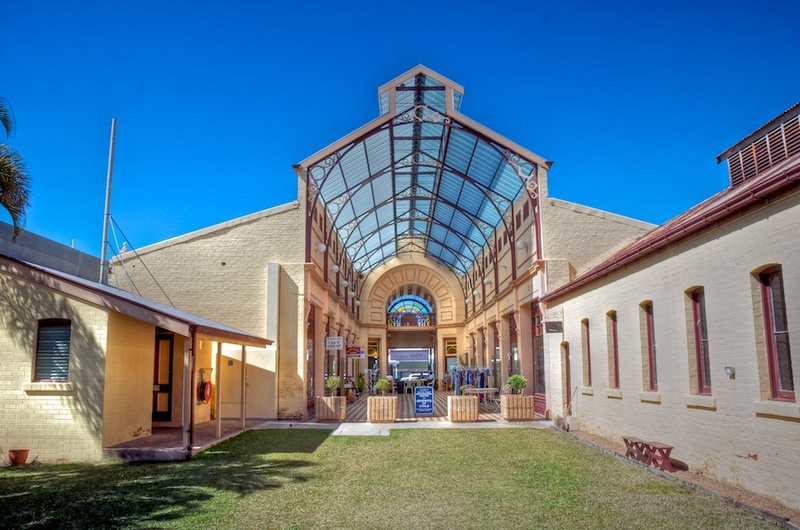 The building has been heritage listed – it is notable for both its history and construction. Among its features is a glass canopy covering the tiled common space of the arcade. The arcade was acquired by the Charter’s Towers Council in 1971, and due to the disrepair the building had fallen into, a general restoration of the building was done in conjunction with the National Trust. 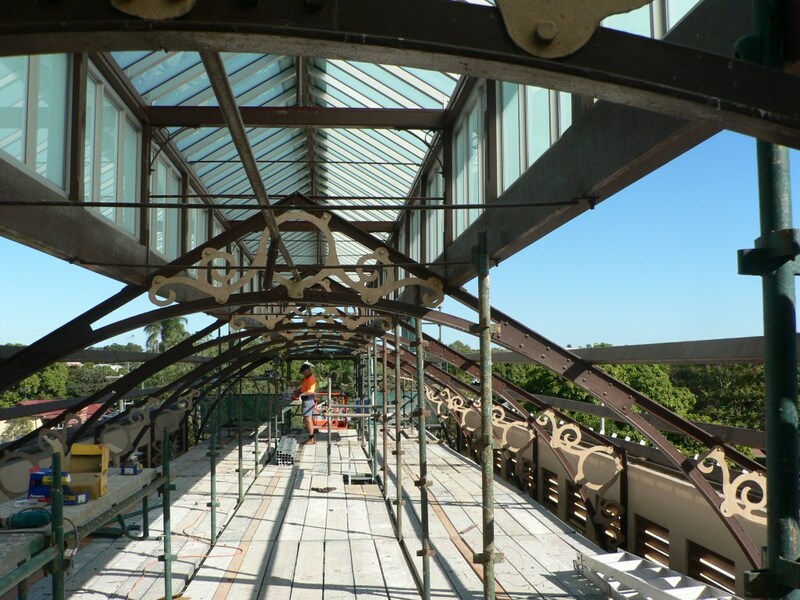 As part of the original restoration the glass canopy was replaced with a wired glass & aluminium framing system, which met glazing standards of the time. This had deteriorated over several decades, began to leak, and was generally in a poor state. Additionally the 6mm wire cast glass used in the canopy was not up to current safety standards, as wired glass is weaker than laminated glass and is much less safe if broken. For the 3 month duration of the latest restoration project, G.James acted as the builder, programming all construction works. Given its heritage value, exceptional care was taken to avoid damage to the building throughout the works, particularly the tiled floor which had to support scaffolding for the roof refurbishment. The old roof was removed and replaced with 12.38 mm translucent laminated glass, which was structurally glazed to the new aluminium frame. G.James’ 265 series fixed windows were used in the vertical section. Whilst this modern glazing system is certainly different from the original, it is a subtle enhancement, and elements such as the existing wrought iron and timber roof framing serve to seamlessly blend the new with the old. This project was undertaken for the National Trust of Queensland. 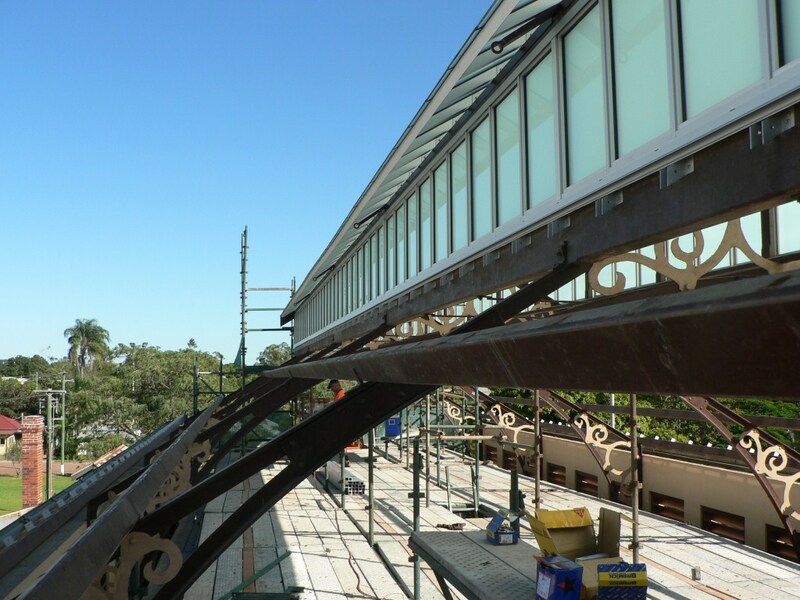 To find out more, please visit our specialised glazing gallery, or contact G.James Glass Contracting on (07) 3877 2225.